In today’s fast paced work environment it is important for employees and employers alike to promote healthy working behaviors and surroundings. Healthy employees are more productive, have fewer absences and are less prone to work-related injury. It is therefore no surprise that in recent years, companies have put more effort into promoting healthy lifestyles among employees and reducing work-related stress, illness and injury. A survey from 2017 found that 78 percent of employees believed their company's wellness program had a positive impact on worker's health, while 75 percent believed such programs had a positive impact on productivity and performance. Unsurprisingly, work-related physical injury occurs most commonly in professions dealing with heavy machinery and requiring strenuous physical activity, such as logging work, fishing, and structural iron and steel work. 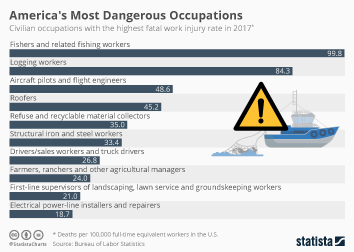 In 2016, there were over 5,000 deaths from occupational injury in the U.S., with the largest portion involving those aged 55 to 64 years. While those with jobs not involving physical danger are still prone to sickness, a large portion of people still go to work even with a cold or flu. A Statista survey from 2017 found that 47 percent of those aged 18 to 30 years went to work when they were sick within the past year, compared to 38 percent of those aged 46 to 60 years. Furthermore, 58 percent of those aged 18 to 30 years took less than six sick days in the past year. Stress from work can be a major cause for absenteeism and can also impact workers productivity and lead to burn-out. The main causes of stress at work include workload, people issues, juggling work and personal life, and a lack of job security. According to a recent Statista survey, 74 percent of employees stated they felt stressed often or sometimes, compared to 70 percent of those with management responsibility. Such information has inspired more employers to provide employees with benefits and programs to reduce stress. Popular elements of such programs include employee health screenings, health education, and supportive physical and social environments for health improvement. More interesting topics from the industry "Health & Pharmaceuticals"